You're cruising at 30,000 feet when you hear an ominous “BANG!” from somewhere at the back of the plane. 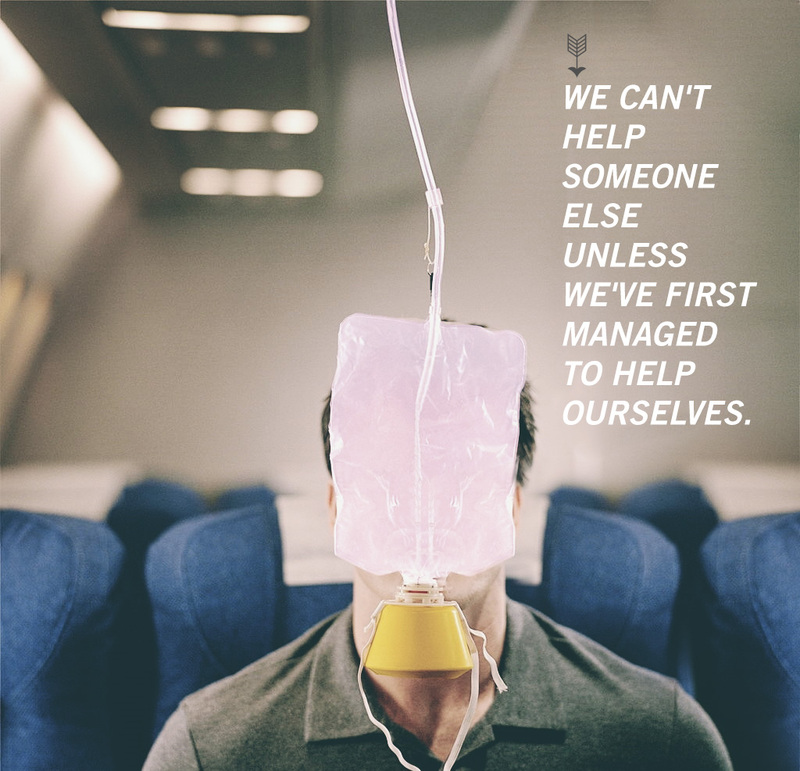 An alarm starts buzzing and the oxygen masks drop down from the ceiling. What's the first thing they tell you to do? Anyone who's flown even once can give you the answer. I can't count the times I've given that scenario to my clients. And no matter how many times I give that speech, I receive the same answer. And that's the absolute truth right there. We can't help someone unless we've first managed to help ourselves. We need to be selfish. As baffling as that might sound. The reason plenty of us will recoil at the suggestion we should be selfish is because, for all our lives, we've been fed a warped idea of what selfishness is. From Aesop's Fables to A Christmas Carol to The Wolf of Wall Street, we're told that reckless egotism and greed will eventually come back to bite us. That a life given to hedonism and reckless abandon will ultimately leave us feeling hollow and unaccomplished. That callous disregard for the wellbeing of others will one day leave us alone and helpless, finding no friends when we most need them. Nobody can (or should) take care of us better than us. …Because we all have them. No matter where we are in our self-development journey. We'll always be facing the temptation to bite off more than we can chew, and that's going to be especially true in our twenties. Our first couple of jobs will be, for many of us, our proving grounds. The place where we'll show everyone, most of all ourselves, that we can handle the big, bad world and take whatever punches it throws at us. While there's nothing wrong with any of that it's still possible for us to get carried away, and even the most brilliant and best among us are still far from invincible. No matter what the task, there’s only a finite amount of energy and ability we have. And there's nothing wrong with that. This isn't to say that we should all stay inside our comfort zones – that kind of extremism would be indicative of a more unhealthy, destructive version of selfishness, the kind we should avoid. Rather, it's to help us retain our good health, energy, and yes, our sanity so that we can still push ourselves in times of real emergency or opportunity. Again, we're no good to anybody dead. …And that there's nothing wrong with that. Some folks seem to get it into their heads that wanting more is a sign of materialism, shallowness, or conceit. That real peace comes from accepting one's assigned station in life, and that seeking anything more is a symptom of emptiness inside ourselves. And don't get me wrong – there are plenty of folks who are this way. The kind of people who'll empty their wallets to buy every new gadget or doodad because they think everlasting happiness can be found in a catalogue or won on eBay. The kind of people who fling themselves from one diversion to the next, trying to distract themselves from how unhappy they really are. But that's not the healthy kind of selfishness we're talking about here. A healthy degree of selfishness means being able to accurately recognize, separate, and prioritize your needs and your wants. It does not mean, however, you should feel guilty about wanting things with no great or grand reason other than that you want 'em. Whether it's a cold beer on a warm summer evening, a house with a view of the lake, or a ‘78 Corvette, there's nothing wrong with simply wanting things. We might not need these things, but we don't need to have some great or grand motivation for us to justify pursuing them. If we want that promotion, let's go for it. If we want to try out skydiving – well, why not? Curious about that coffee table book? Thinking about rocking a flannel tie? Well, if we're armed with the right attitude, just go for it without guilt or fear. There's not a finite amount of joy in the world, folks – denying ourselves does not increase the joys of others by one iota. Not that we can't help others. Not that we can't support others. Not that we can't be patient or compassionate. I mean that we literally cannot live on behalf of others. Yes, that sounds cruel, perhaps even sociopathic. But the unwavering reality of the situation is that placing ourselves first is the only real option we have. Look – almost all of us have someone in our lives going through a rough time. We all know someone struggling through poverty or a bad relationship. Addiction, in one form or another. Emotional baggage, bad choices, misplaced goals – you name it. We should be there to help these folks. Not needing to be a part of that fight would make us bad friends (and, I'll say it) bad people. But we cannot, I repeat, cannot make other people's life choices for them. That would be cruel and psychotic. True, healthy selfishness doesn't mean not being there for others, but means knowing that we can't live someone's life on their behalf. Doing so would rob both us and them of any real existence. Doing so would make all of us less human. A proper sense of selfishness means that we have to establish boundaries for what we will and won't do for others. Need a ride from the airport? I'll be right there. Wreck your car due to repeated carelessness? I'll commiserate with you at the bar, but you're gonna have to walk there. For most of our lives, we've had folks telling us what we should and shouldn't want. “Get a good job”, we're told. But what makes a job good? Seems a little convenient that a “good” job is almost always a well-paying one. And what's so good about getting a lot of money? Well, it lets us buy the things we want. Don't know what we want? Don't worry – that's what TVs and pop-up ads are for. One of the signs and results of healthy selfishness is a kind of fierce independence. We want the things that we want – not the things society tells us to want. And when we pursue those things without guilt we almost inevitably find ourselves blazing our own trail (and being made smarter and stronger as a result). In a way, selfishness can be one of the most altruistic things we can aspire to. If you're really and truly interested in giving of yourself, there has to be a “yourself” to give of. The man who puts his dreams on hold to be a so-called productive member of society could very well rob that society of his talents. He could be an inspiring artist, a brilliant doctor, a fiery politician. And it could just as easily be the reverse. He might live out his dream of being a doorman at a hotel. Nothing glamorous, but his enjoyment of the job will mean that he's the best damn doorman anyone could ask for. Someone whose positivity and friendliness sends ripples through everyone around him. He might even be the sole person to help someone going through hell to push through it. Just as we can't live someone else's life, we really can't live our own without a healthy sense of selfishness. And that goes so far beyond the impulse buy or the occasional day off. It comes down to your most fundamental needs and desires. Wanting recognition for your accomplishments doesn't make us vain, it makes us healthy, well-adjusted individuals. While our sense of self-worth shouldn't hinge exclusively on the opinions of others, taking legitimate pride in the fruits of our hard work encourages us to take pride in the work itself. Wanting to be in control helps you take the initiative. A healthy desire for friendship will make us more pleasant and friendly. A healthy desire to be liked for the person you are will help you look for those friends in the right places. It's perfectly simple – wanting something isn't the same as being something, but it is always the first step. Obviously – but again, how many people choose to ignore this? We get taught (not maliciously, but still harmfully) to limit ourselves to small, reasonable requests. Be practical, we're told. Aim low and we'll never be disappointed. Only we'll never be truly satisfied either. Many folks will do that. Convince themselves that a beer or two on the weekends and a few hours of mindless TV are really all they ever needed to be happy. Flash forward 30 years and we have a pandemic of mid-life crises as so many folks desperately try to figure out what went wrong (sing it with me folks: “And you may tell yourself / This is not my beautiful house / And you may tell yourself / This is not my beautiful wife”). Wanting independence is a healthy impulse. Wanting to build a legacy is a healthy impulse. 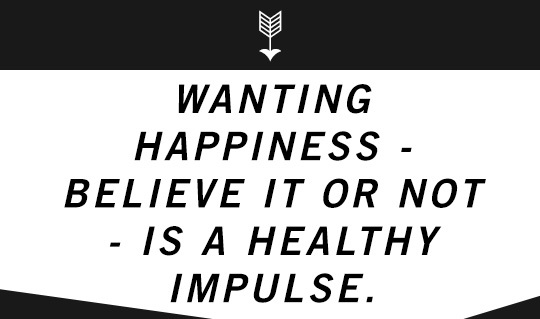 Wanting happiness – believe it or not – is a healthy impulse. So let's invest in ourselves. Let's make a conscious effort to strategize for our own wellbeing and prosperity. Let's do so without guilt or dread or the idea that someone else will take care of our happiness and fulfillment for us. This is not to offer another one of those sappy, saccharine, we-can-do-whatever-we-want-if-only-we-try spiels. Which is why a healthy degree of selfishness is crucial. Why not choose the things we care about? That was a really good article. Especially being the bit about treating yourself. I feel like clothes are an investment to me, and buying them and improving my personal style is something that I enjoy. Having said that, everything in moderation and I know when to stop buying things and when I have to focus on my needs rather than my wants. Completely agree! That wasn’t so much referencing buying things to be happy, but for achieving whatever it is for each of us to feel content / satisfied. For some that’s a flexible job, others it’s being able to travel, and for some it’s an iPhone. Thank you for clarifying this!I loved the article tho! As a 20-something guy living his post-college years I had to realise that the hardest thing for me was to set my goals. We live in a world where we can access almost all the knowledge in a heartbeat and we can truly become whatever we want to be. However we just don’t have time to walk on every single road. Setting the right priorities is crucial and this article helps a lot. Thank you! Gordon’s pieces on Primer are some of my favourite articles I’ve ever read. It seems like each one I read is just a fountain of wisdom and inspiration to be a better man.